Fashion and Hollywood frequently go hand-in-hand, but it’s not every day that a brand announces a collaboration with an actor as noteworthy as Robert De Niro. Ermenegildo Zegna’s SS17 campaign, entitled ‘Defining Moments,’ does just that. Behind the scenes of the ‘Defining Moments’ campaign making of. ‘Defining Moments’ signifies a shift in the luxury menswear label’s marketing strategy, Zegna’s Artistic Director, Alessandro Sartori, envisions the campaign as creating a dialogue between the brand and its customers. ‘Defining Moments’ includes a classic print run, but the heart of the SS17 campaign is a series of short films starring the iconic Robert De Niro, and McCaul Lombardi, a Hollywood newcomer and star of 2016’s American Honey. Robert De Niro and Mc Caul Lombardi discussing during the making of “Defining Moments”. Directed by Francesco Carrozzini, the films capture De Niro and his co-star discussing the defining moments of their careers, while interacting with the Ermenegildo Zegna garments they have chosen to wear. The conversations between the master and the student, framed by Zegna’s clothes, allow customers to create a more personal association with the brand, by living their own defining moments alongside Ermenegildo Zegna. Founded in 1910 in the Italian town of Trivero, Ermenegildo Zegna has stayed in the family for over a century, being passed down through four generations. From humble beginnings in the Biellese Alps, Zegna has grown to be the world’s largest menswear brand by revenue. Soon after the initial Zegna loom was opened, the label gained a reputation for producing fabric of an excellent quality, which led to its 1938 expansion to New York as the Zegna Woollens Corporation. Significant milestones include the 1968 launch of the brand’s first ready-to-wear line, and the opening of its first boutique in Paris, in 1980. In the meantime, Zegna has continued to grow, opening hundreds of boutiques in various locations around the world. In choosing Robert De Niro and McCaul Lombardi as the faces of the ‘Defining Moments’ campaign, Zegna brings to-gether two men with much in common – their love for acting, a shared Italian-American heritage, and a certain natural elegance – while simultaneously creating a space for passionate dialogue around the defining moments of their careers, one of which is the stuff of legend, and the other which has just begun. In one of director Carrozzini’s short films, De Niro offers Lombardi insight into his acting philosophy and the benefits of risk-taking, but tempers this with a look at what both draws him to, and makes him shy away from different roles. Zegna brings together two men with much in common – their love for acting, a shared Italian-American heritage. Lombardi, who is visibly keen to learn from De Niro, asks him about his various notable mentors, and working with icons like Marlon Brando. De Niro talks about his early days as a young actor, and how he and his fellows felt a reticence to do TV work, fearing that it would trap one. Interestingly, television is now one of the most sought after mediums for an actor, due to the scope available to a character within a series as opposed to a single film, and so through the sharing of ideas and opinions in the ‘Defining Moments’ campaign, we learn of the changing world that we all live in. Alessandro Sartori, Artistic Director of Ermenegildo Zegna, believes that the ‘Defining Moments’ campaign will change the way in which customers interact with the brand. The core concept of the campaign is a move away from the brand presenting a monologue or single perspective to its consumers, instead focusing on human conversation and meaningful interactions. According to Sartori, much of Zegna’s story is “defined by the people who wear it – people around the world from different generations and with different experience.” This sentiment was echoed by Gildo Zegna, the current CEO of the company, in his observation that both the consumers of the brand are changing, along with their demands and the market within which Zegna operates. Robert De Niro and McCaul Lombardi are the faces of the ‘Defining Moments’ campaign. Ermenegildo Zegna has seized this need for change and transformed it into an opportunity to add a new chapter to the long and illustrious history of the brand. While the suit has long been the centrepiece of Zegna’s menswear lines, the ‘Defining Moments’ campaign aims to both enrich and soften the mythology around the iconic garment by using it to frame an open and emotional exchange of ideas between two men at the top of their game. 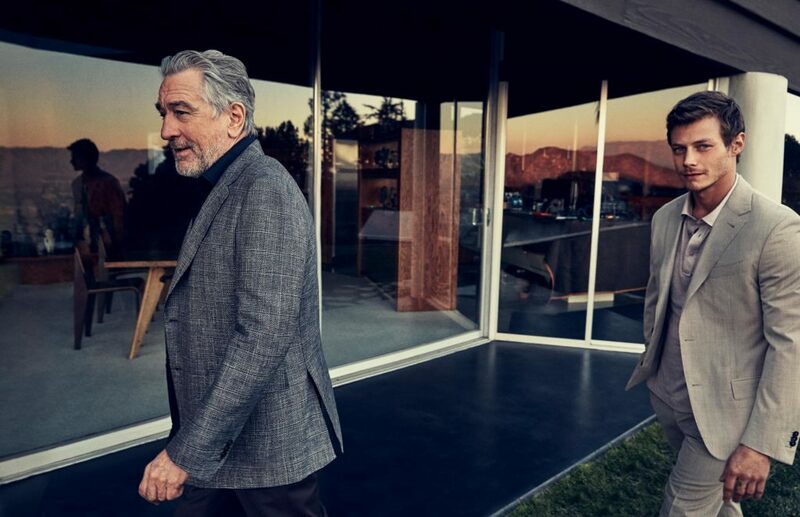 Robert De Niro and McCaul Lombardi will surely enable Zegna customers to connect with the brand on a new level, by offering up their own aspirations and memories as points of contact. Photos credits : ‘Defining Moments’ campaign by Zegna. Starring Robert De Niro, McCaul Lombardi. • Where to Zegna in South Africa ?